If you have used them, what amp have you partnered them with? They are very nice! 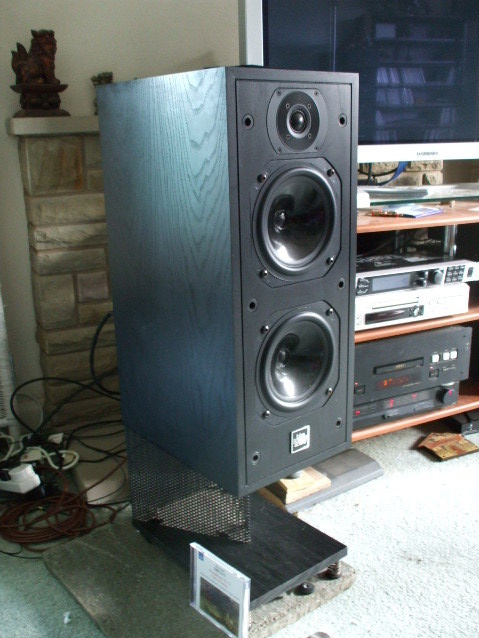 I’ve always favored speakers configured this way, have owned a few. But not the B&W. I’m sure they are compatible with many amps, except for low wattage tube amps maybe. It will take 50 watts to get these moving, and 150 watts will not be too much! I ran a pair of speakers that had two 8” woofers, vertically, and a horn tweeter on top with an Adcom 555, 200 watt amp, and it was awesome! So don’t be afraid to give them some power. What would you think would be suitable out of the following that I am able to use? I've lost count the amount of times I've had problems of reduced output on B & W tweeters due to ferrofluid drying out. B & W seem to be more prone to this than most and tweeter TZ26 SL fitted to model DM1400 (you quote model DM14 in your post but the first photos are of model DM1400 subsequent data sheets are of DM14). Model DM14 to which you refer in your text (the previous version) is just as bad with tweeter TW26.Of course, it is possible to clean out the dried up crap but you will need to ascertain the exact spec of ferrofluid and the precise amount required and the first port of call would be B & W but from my experience with them, you may have difficulty in obtaining this info. You could, of course, replace the ferrofluid without going into this detail or indeed leave them as they are - but you will appreciate they won't be to original specification - performance will not be as original design intended. Or you could forget playing around with ancient speakers and buy yourself a new pair. At least they will be to factory spec and I'm sure B & W would prefer you to do this. Hi Charles thanks for taking the time. I have obviously posted the wrong picture. The speakers are definitely DM14 which would mean the tweeters are TW26 according to your post. If they ever need replacing can you recommend a modern alternative? Hello there. Well, I' m sorry that I can't recommend replacement tweeters - you see, they would never sound the same again - I mean, replacing those B & W tweeters with anything else would change the sound balance of the speaker - they would still 'work' but would not sound as the designer originally intended and to factory spec - which is a shame really because when they were within factory spec they were a very nicely balanced speaker (I used to sell 'em). B & W don't service those tweeters any more so your choice is to live with them in the knowledge that they're more than likely out of original factory spec or get rid of them and buy a new pair of speakers. Notwithstanding this, I have seen someone on Ebay selling TW26 diaphragms - supposedly. Now, if B & W could supply you with the exact spec of ferrofluid they originally used in TW26 then theorectically, if this spec was still available and those diaphragms are the business then you may be able, with a little work, to get those tweeters to approach original spec. It's a long shot but your first port of call would be B & W. Unfortunately, my last dealings with them confirmed to me that they're not the company they used to be - certainly not the same as at the time those DM14's were built. They will probably be more interested in selling you one of their more modern screech boxes. Like I said, it's a shame really because many of those ancient B & W speakers sounded half decent but the the tweeters suffer from ferrofluid evaporation. I had a pair of older Bowers Active One - which look pretty much the same configuration but with some power amps on board. One of the tweeters was DOA (pretty sure it was a TW26) and I just bought a couple off eBay and it was fine. Push fit terminals, so I didn't even need to try and solder. Best sensibly priced B&W I have heard, quite possibly the best B&W. Even if B hadn't yet teamed up with W!